Local authorities from the Region of Crete have turned their attention on the lucrative US market, targeting the American public in an effort to boost visits. The New York Times Travel Show is the longest-running trade show for tourism in North America aimed at both professionals in the field and consumers. 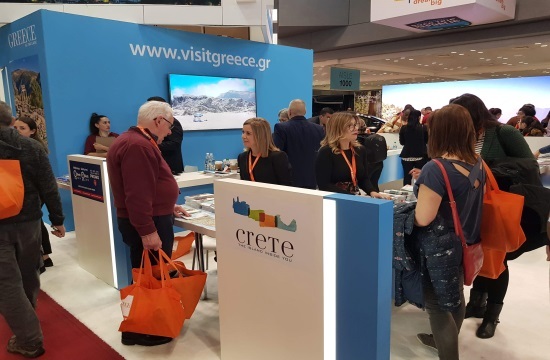 This year, Greece was a silver sponsor and its pavilion, which was more impressive and larger than last year, was situated at the front part of the expo centre, thus offering higher exposure and more visits by the visitors and tourism professionals. The pavilion of the Region of Crete was at the centre of the stage and became the focus of interest by visitors, the media and tourist agents. Diplomatic officials and representatives of the Greek community also stopped by and talked with the staff at the Cretan pavilion. All of the visitors were treated by the amazing display of a Cretan dance group that presented traditional dances.